Luxury is something we seek after a tiring week at work. After a long journey or a tiring day, a relaxing atmosphere is what we look out for. Bangalore, being an industrial hub, the need of luxury, comfort and a soothing environ is ever more. Here are the best picks from some of the most luxurious resorts in Bangalore. Get relaxed, beat the stress, and feel refreshed and rejuvenated! One of the best rated resorts in Bangalore, Clarks Exotica Resort & Spa is an ideal choice to spend a weekend in the lap of luxury. 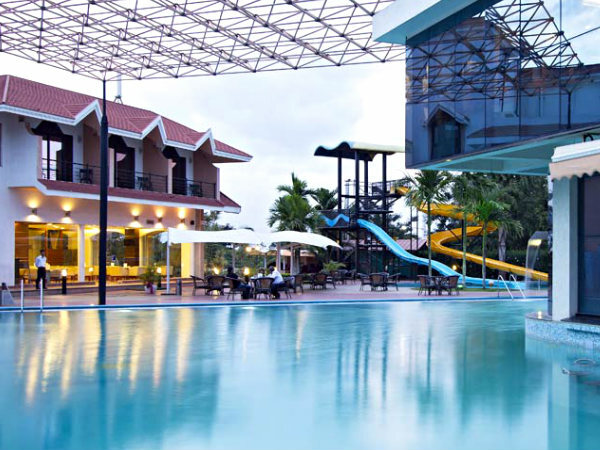 Located close to Nandi Hills, the resort is just a 15 minutes drive from Bangalore Airport. From excellent dining options and luxurious interiors to a well equipped fitness centre and scope for kids' recreation activities, Clarks Exotica has it all. The Golden Palms is located close to the Bangalore International Exhibition Center (BIEC). Suitable for luxury travellers and corporate travellers alike, the resort enjoys provides with all the facilities and amenities to enjoy a perfect getaway from the daily stress. The facilities of the hotel include spa, tennis court., health club. Pool table and extensive dining options. This beautiful cave resort is for those romantic couples who can spend a day or two at a slow and lazy pace as they stay in a cave resort, the one of its kind in India. You can listen to the gurgling of water and feel the soft breeze brush your hair, and get lost in the mystical magic of the place! The resort offers modern amenities and accessories and cater to the requirements of its guests with their array of services like wellness centre, kids; play area, Health Club, Swimming pool elevator, etc. The Angsana Oasis and Spa Resorts is one of the most luxurious resorts in the city. The resort helps you forget your tedious schedule and also to wrap yourself in luxury. Give yourself a lavish treat to a refreshing experience and stay at a peaceful environment. Whether you're here for a corporate gathering or a leisure trip, Angsana is apt for every mood. The resort is located at Main Doddaballapur Road in Bangalore. Open your eyes to a whole new experience of wonderful architecture, serene ambience and comforting luxury. Jade 735 is located just 10 minutes away from Bangalore International Airport, offering a world of opulence. Jade 735 is a pet friendly resort that also has spa facilities, swimming pool and a fitness centre among other facilities.